The construction economy is still good. Commercial is strong and residential is still in positive territory. Housing prices are still moving upward mostly due to a lack of inventory and pent-up demand. The major disappointment is that public construction is down. Public construction has been stalled, but it may finally climb out of its slump with the rebuilding efforts we usually see following large hurricanes. Unfortunately, the infrastructure initiative we’ve been promised in Washington seems to also be stalled right now, so no help there. Wages are up 4-5% for the year. All in all, the construction industry will probably remain strong for next year. 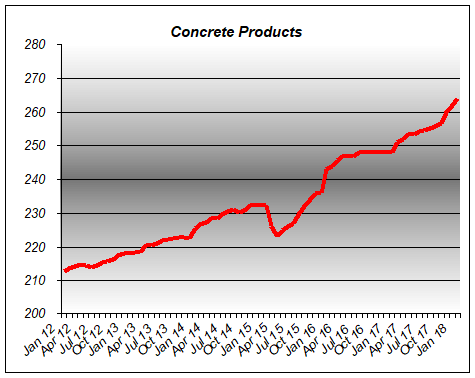 Construction commodities remain up, while some still show double-digit gains. Fuel will remain high until the refineries in Texas get up to full production (though rises in the price of crude may continue to keep prices high). 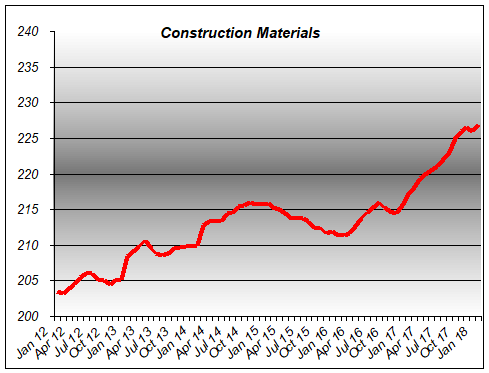 Materials are 4-5% up for the year and appear to be continuing to rise. After rallying in 2016 with gains of 6%, lumber is on an accelerated path with gains of 10%. This up cycle is happening despite an erratic increase in housing starts. We’ll just have to watch the effect of supply/demand on lumber. 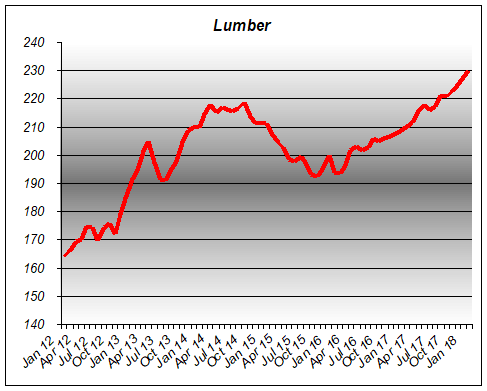 With the housing industry not behaving consistently, forecasting the price of lumber has become quite a challenge. Steel was once the component everyone watched. It was down to flat and languished from 2011 through 2016. The price suddenly spiked in mid-2016 but then declined to finish the year at a 1% rise. 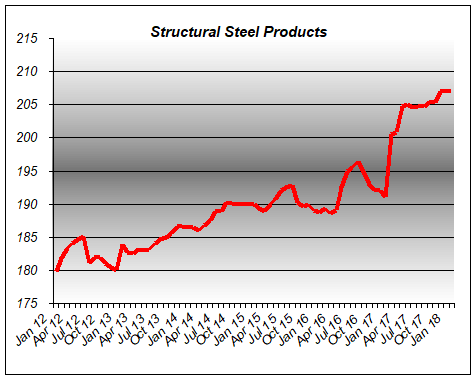 In 2017 we saw a different story, as steel jumped a healthy 6-8%. In 2014 we reported 12% gains for aluminum. Then we saw a complete reversal of fortune with decreases of 12-15% in 2015. Gains of 5% happened in 2016. 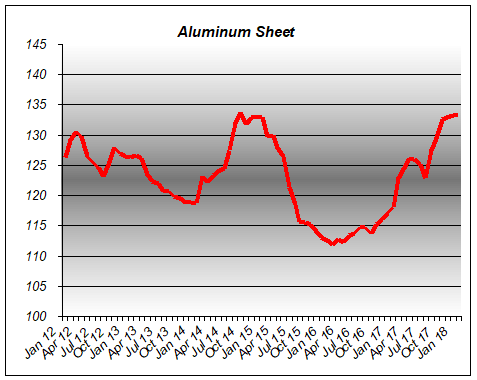 Now we see aluminum matching the highs of 2014 with yearly gains of 13-14%. We’ll just have to wait and see if aluminum has run its course. 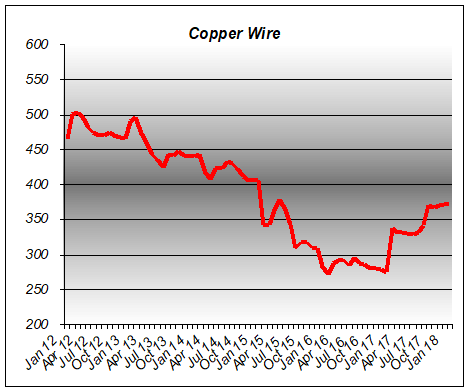 Copper reversed its losing trajectory, registering a gain of over 35% for the last 12 months. It’s still below the price level of 2012, but the gains seem to be sustained. It is not the first time that we’ve seen this component on a roller coaster ride.